U.S. Sen. Marco Rubio is introduced at the Prescott Bush dinner. 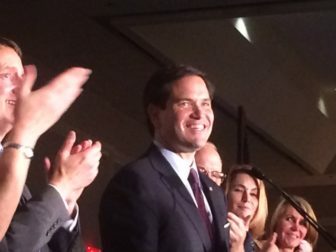 Stamford – At a GOP dinner named for Prescott Bush, patriarch of a Connecticut family that has produced two presidents and one contender, U.S. Sen. Marco Rubio of Florida said Thursday that America craves new leadership. He named no names. And he spoke with the gentleness of a man reading a bedtime story to a child, not the big voice of a presidential candidate road-testing a message. But Rubio, 44, left no doubt he wants voters to see Jeb Bush, 62, and Hillary Clinton, 67, as unequal to the task. He was introduced by state Sen. Art Linares, 27, of Westbrook, a fellow Cuban-American who served as an intern for Rubio. Jerry Labriola, the Republican state chairman is committed to Rubio. It is a comparison that Rubio encourages. If elected, Rubio would be the second Catholic president after Kennedy and the youngest U.S. president since Kennedy. He never mentioned Kennedy by name, but he invoked his 1961 inaugural address. His audience included two television personalities who live in Connecticut, Joe Scarborough of “Morning Joe” on MSNBC and Larry Kudlow, the supply-side economist who’s had programs on CNBC. Rubio smiled and gave a shout out to both. Rubio made no waves in his 27-minute speech to the major annual fundraising dinner of the Connecticut Republican Party. His stump speech, or at least the version still getting play seven weeks into his campaign, is biography and big picture. He is the son of a banquet bartender and a maid, who could not afford to contribute to his college tuition, leaving Rubio, a lawyer, with $100,000 in college loans he only recently repaid. Rubio folded a zinger against Hillary Clinton into his story of growing up poor. A year ago on the same stage, Jeb Bush talked passionately of the need for immigration reform, but Rubio said nothing Thursday to upset the Tea Party activist who helped him defeat Charlie Crist, the Republican turned independent, in the 2010 Senate race. He was applauded. Connecticut’s GOP is both smaller and more ethnically diverse than in the days when Prescott Bush of Greenwich was a U.S. senator. Rubio’s candidacy poses a special problem for Jeb Bush, the one-time mentor who shares the same political base of Florida. Rubio was unapologetic for crowding Pres Bush’s grandson. “Now, there are those who suggested I wait my turn. That’s the same thing they said back in 2009 when I ran for the Senate against the then Republican governor of my state of Florida,” Rubio said. Rubio faces a challenge winning early support here. Connecticut is a good place to pick up fundraising help, but Tom Foley is already off the market. He’s signed up with the exploratory effort of New Jersey Gov. Chris Christie, who supported Foley’s gubernatorial campaign last year. State Sen. Rob Kane of Watertown is committed to U.S. Sen. Rand Paul of Kentucky. “He’s my guy,” Kane said. State Rep. Terrie Wood of Darien, a native of Ohio, says she is waiting to see if Ohio Gov. John Kasich gets into the race.